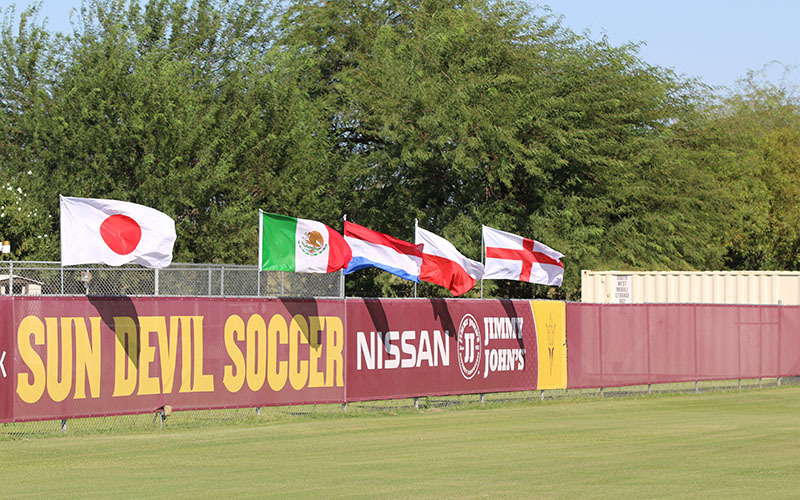 TEMPE – Arizona State prides itself on being an attractive university for international students, a mindset that is trickling down to its athletic programs. Englishman Graham Winkworth, in his second season at the helm of the ASU’s women’s soccer team, placed an early emphasis on recruiting international players because of a unique dilemma. Upon his arrival in December of 2016, the majority of players in the 2018-20 classes had already committed, focing Winkworth to widen his recruiting area. In total, Winkworth brought in 18 players in his first full recruiting class, including five international ones. He signed players from Germany, England, the Netherlands, Japan and Mexico. 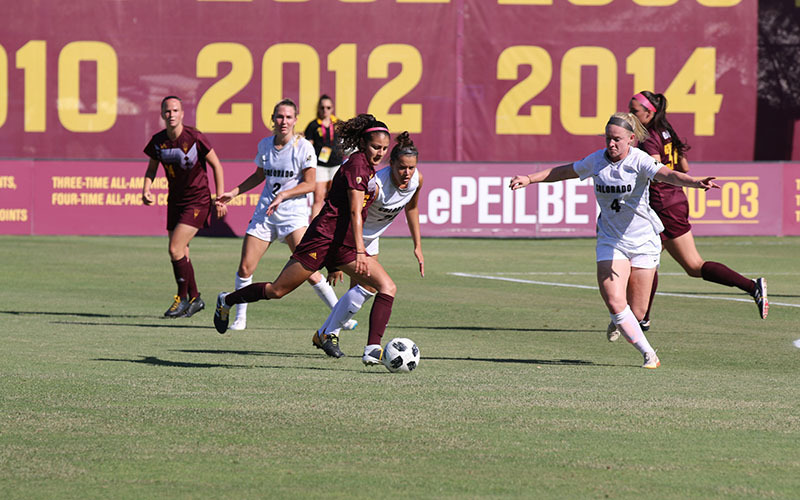 They have contributed to a 6-3-1 start this season for the Sun Devils, who have already surpassed the team’s win total of last year. Recruiting internationally presents its own challenges, something that Winkworth has been aware of throughout his coaching career. Born in Reading, England, he has established a network to help him find the best overseas players. Those inroads have resulted in Winkworth bringing in some top-tier international players that have made an immediate impact in maroon and gold. Even with his connections, Winkworth still had to be creative in recruiting. That wrinkle in the recruiting system was a key piece in landing some talented players to ASU. Nicole Douglas, from England, is pacing the team this season with six goals. The level of competition sold Douglas on coming to the desert. Winkworth is no stranger to recruiting internationally. One of his most talented players is senior captain Jemma Purfield from England, who he initially recruited to play at the University of South Alabama. Winkworth convinced Purfield to transfer to ASU after he accepted the head coaching job in Tempe. Purfield knows that as a leader and as an international player herself, she has experience that other players can lean on. On and off the pitch, the transition is happening about as smoothly as anyone around the program could have hoped. Off the pitch, the players aren’t alone. They can lean on fellow international players like Purfield, sophomore midfielder Lara Barieri, a native of Brazil, or sophomore goalkeeper Nikki Panis from Canada for experience on managing a college soccer career thousands of miles from home. The local players help as well, providing a sense of home for the players for their day-to-day lives. On the pitch, the five international freshmen have accounted for 12 goals this season, scoring 11 and assisting on another. Stylistically, Van Deursen, Douglas, Mexico’s Alexia Delgado, Japan’s Hikaru Minami, and Germany’s Marleen Schimmer play different brands of soccer. However, they’ve blended those differing styles successfully for Winkworth. The international flavor has help ASU start the season strong. 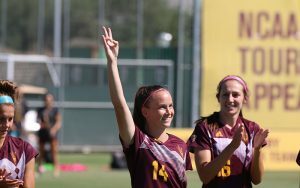 Although Winkworth said he intends to look for players from the Phoenix area first, his world-wide recruiting strategy promises to add an international flair to ASU’s women’s soccer program for years to come.